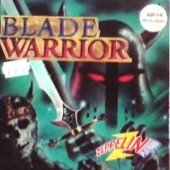 Blade Warrior is a very stylish arcade adventure game from Image Works/Mirrorsoft, set in a fantasy world. Although the premise and gameplay is not that different from most other fantasy hack-and-slash side-scrollers, Blade Warrior sets itself apart with a striking presentation and a lot of style. 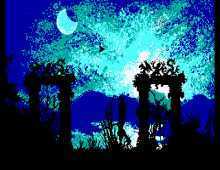 The action takes place at night, so your character is always in the silhouette, as are all the monsters and most components of the backgrounds. The game makes effective use of shadows and light-affected palette, successfully creating the cool Twilight Zone-style atmosphere that many games, most notably Domark’s Shadowlands, tried but failed to achieve. The characters’ movements are also very realistic for games of this period. Monsters lumber about in their shadows, and you can almost feel the weight of your hero’s sword as he brings it down on unfortunate creatures. Many monsters are hard to make out in the silhouettes until they get close to you — making the game a heart-pounding, appropriately creepy affair in some spots. There are also some adventure elements such as finding the right way to exit the screen and using objects, but they are minimal. Overall, I find Blade Warrior a nice change from other side-scrollers. The effective use of shadows and a unique graphical style makes the game one of the better-looking and atmospheric games in the genre. Highly recommended for all action gamers, especially fans of Conan or Savage. Two thumbs up!